The owner of the capsized ferry MV Mercraft 3 handed over 100,000 to a conman pretending to be Department of Transportation (DOTr) chief Arthur Tugade. Six people are now confirmed to have died after the MV Mercraft 3 turned over after hitting a metal fishing buoy off Quezon Province amid heavy weather. Another 243 passengers were rescued by authorities and volunteers. Since the ship’s owner paid out the cash, which he believed would avoid having the ship’s licence suspended, the DOTr has warned the public to be wary of other possible scams. The DOTr also emphasised that Tugade would not approve of any solicitation in whatever form or manner as such is “considered illegal and unlawful”. “The DOTr condemns such fraudulent acts and vows to coordinate with proper authorities to swiftly investigate and determine those who are responsible behind this scam,” the agency said. According to the DOTr, Eruel Merana, owner of the ferry that sank between Dinahican and Polilio Island, received a phone call yesterday (Friday, December 22) from a certain “Acosta”. He identified himself as being from the Northern Quezon coast guard station and told Merana that Tugade wanted to talk to him. When Merana arrived at the station in Real town, he was handed a mobile phone and spoke to a person claiming to be Tugade. 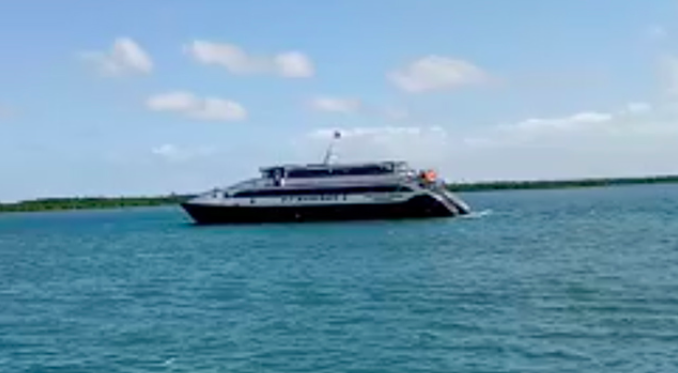 In that call, Merana was told to pay 100,000 pesos “to avoid the suspension of documents and licences” of the capsized ferry. The DOTr said that due to “trauma and panic,” Merana sent the money through a cash transfer facility. The recipient was a certain Eduardo Austria Jr.
Today (Saturday), the same person claiming to be Tugade again called Merana and asked him for a further 50,000 pesos. The caller said the money was for Maritime Industry Authority administrator Marcial Amaro. However, this time Merana told the caller that he would not be able send any money because banks are currently closed for Christmas. Following the incident, the DOTr has called on the public to be “more vigilant and discerning,” and report any cases in which Tugade’s name, or those of any other department officials, are used.